Stunning video footage showing a UFO fly past the doomed Space X rocket before exploding has gone viral online this week. Experts claim the footage shows an unidentified flying object fly past the launch pad at Cape Canaveral, Florida, and then potentially shoot down the Falcon 9 Space X rocket as it was undergoing tests ahead of a planned launch the next day. Was it a U.S Government conspiracy to stop the launch of the Facebook Satellite? Watch closely in the upper right of the screen at the 11 second mark. An unidentified dark object flies directly over the rocket and exactly as it is over the rocket, the ‘static’ explodes the rocket. The original video was only 8FPS, but this object is still seen streaking over the rocket. Is it a weaponized drone that sabotaged the launch? The object is much larger than a bird, and doesn’t have wings, but it flies very fast, covering the entire view of the launch site in less than one second. 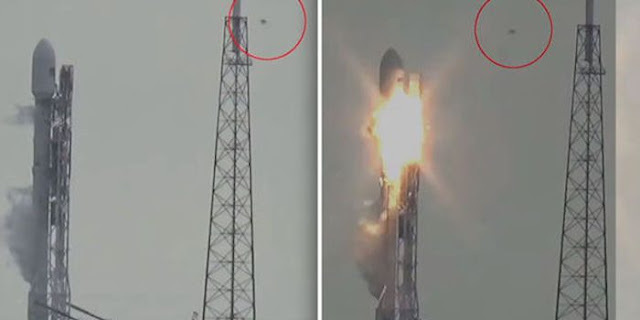 Watch the video closely and there is no mistaking that this flying object was the nearest moving thing in the sky when the ‘static’ explosion occurred.